Puerto Rico and the northern Virgin Islands define the eastern terminus of the Greater Antilles, which extend eastward from offshore eastern Central America to the Lesser Antilles volcanic arc and mark the boundary between the Caribbean and North America plates. In Hispaniola, Puerto Rico, and the northern Virgin Islands, the Puerto Rico trench and the Muertos trough define the northern and southern limits of the plate boundary zone, respectively. The Anegada Passage, which separates the British Virgin Islands and the island of Anguilla, is reported to be a "tectonic" boundary between the Lesser Antilles forearc block and the Puerto Rico-Virgin Islands block. 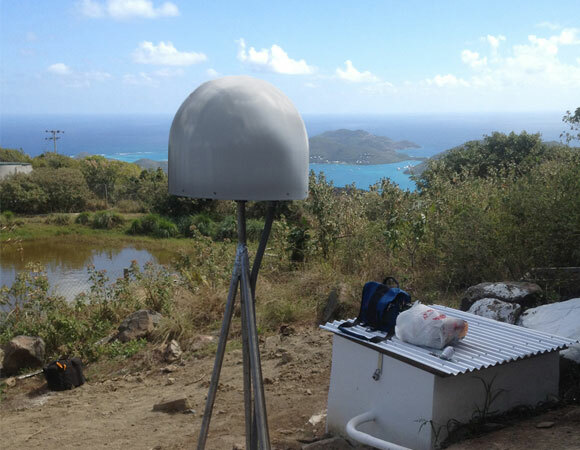 A new continuous GPS site installed as part of the Continuously Operating Caribbean GPS Observational Network (COCONet) project will allow researchers to test kinematic and block models more rigorously and also potentially constrain elastic strain accumulation along the plate interface. 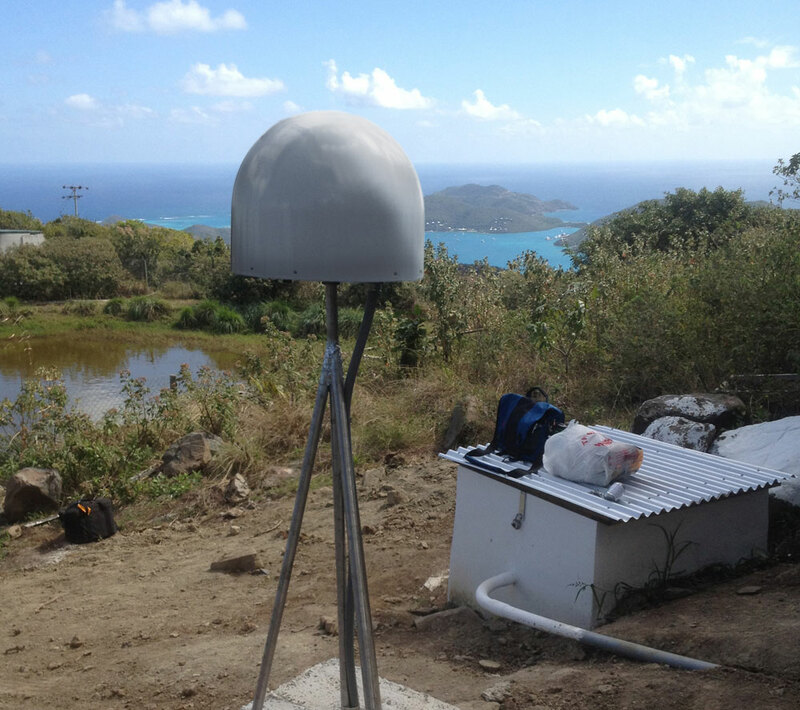 This GPS site has been constructed for the COCONet project on the highest peak of Virgin Gorda in the British Virgin Islands. This site not only has the standard geodetic monument, GPS receiver, and meteorological station to monitor plate and hurricane movement, but also includes a seismometer. Collaborating with Jasen Penn at the British Virgin Isands Department of Disaster Management and Jose Cancel at the University of Puerto Rico Mayaguez Campus allowed UNAVCO engineers to have invaluable help before, during, and after the installation. The ultimate owners and caretakers will be the Bristish Virgin Islands Department of Disaster Management after COCONet construction is completed. The network is currently halfway complete as of April 2013. Figure 1. CN03: Virgin Gorda, British Virgin Islands. Photo by Mike Fend. Jansma, P.E., and G.S. Mattioli, G.S., 2005, GPS results from Puerto Rico and the Virgin Islands: Constraints on tectonic setting and rates of active faulting, in Mann, P., ed., Active tectonics and seismic hazards of Puerto Rico, the Virgin Islands, and offshore areas: Geological Society of America Special Paper 385, p. 13–30.